The history of advertising can be traced to ancient civilizations. It became a major force in capitalist economies in the mid-19th century, based primarily on newspapers and magazines. In the 20th century, advertising grew rapidly with new technologies such as direct mail, radio, television, the internet and mobile devices. Advertising as a percent of Gross Domestic Product in the United States, 1919 to 2007 per Douglas Galbi. Between 1919 and 2007 advertising averaged 2.2 percent of Gross Domestic Product in the United States. In ancient China, the earliest advertising known was oral, as recorded in the Classic of Poetry (11th to 7th centuries BC) of bamboo flutes played to sell candy. Advertisement usually takes in the form of calligraphic signboards and inked papers. 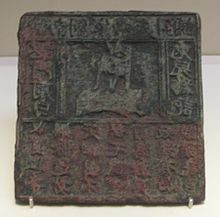 A copper printing plate dated back to the Song dynasty used to print posters in the form of a square sheet of paper with a rabbit logo with "Jinan Liu's Fine Needle Shop" and "We buy high quality steel rods and make fine quality needles, to be ready for use at home in no time" written above and below. is considered the world's earliest identified printed advertising medium. In Europe, as the towns and cities of the Middle Ages began to grow, and the general populace was unable to read, instead of signs that read "cobbler", "miller", "tailor", or "blacksmith" would use an image associated with their trade such as a boot, a suit, a hat, a clock, a diamond, a horse shoe, a candle or even a bag of flour. Fruits and vegetables were sold in the city square from the backs of carts and wagons and their proprietors used street callers (town criers) to announce their whereabouts for the convenience of the customers. The first compilation of such advertisements was gathered in Les Crieries de Paris (Street cries of Paris), a thirteenth-century poem by Guillaume de la Villeneuve. Trademarks: The practice of attaching seals or marks to products was widespread in antiquity. Around 4,000 years ago, producers began by attaching simple stone seals to products which, over time, were transformed into clay seals bearing impressed images, often associated with the producer's personal identity. Some of the earliest use of maker's marks, dating to about 1,300 BCE, have been found in India. By the medieval period, hallmarks were applied to high value goods such as precious metals, and assayers were appointed by governments to administer the system and ensure product quality. Town criers: In ancient towns and cities, where the majority of citizens were illiterate, town-criers were appointed to call out official announcements and general news. Before long, private individuals began to employ public criers to act as an auctioneer. At the same time, itinerant hawkers developed a system of street cries to promote their goods and services. These street cries provided an essential public service before the advent of mass media. Sign-boards: The use of commercial signage has a very ancient history. Retail signage and promotional signs appear to have developed independently in the East and the West. In antiquity, the ancient Egyptians, Romans and Greeks were known to use signage for shop fronts as well as to announce public events such as market days. China also exhibited a rich history of early retail signage systems. In Medieval Britain and France and much of Europe, innkeepers were compelled to erect a sign-board The practice of using signs spread to other types of commercial establishments throughout the Middle Ages. Sign-boards applied to inns and taverns have survived into contemporary times across Britain and much of Europe. Modern advertising began to take shape with the advent of newspapers and magazines in the 16th and 17th centuries. The very first weekly gazettes appeared in Venice in the early 16th-century. From there, the concept of a weekly publication spread to Italy, Germany and Holland. In Britain, the first weeklies appeared in the 1620s, and its first daily newspaper was The Daily Courant published from 1702 to 1735. Almost from the outset, newspapers carried advertising to defray the cost of printing and distribution. The earliest commercial advertisements were for books and quack medicines, but by the 1650s, the variety of products being advertised had increased markedly. Advances in printing allowed retailers and manufacturers to print handbills and trade cards. For example, Jonathon Holder, a London haberdasher in the 1670s, gave every customer a printed list of his stock with the prices affixed. At the time, Holder's innovation was seen as a "dangerous practice" and an unnecessary expense for retailers. 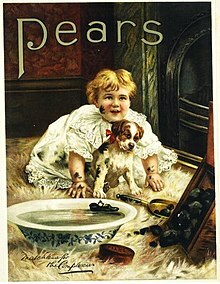 The earliest trade cards were not cards at all, instead they were printed on paper and did not include illustrations. By the 18th century, however, they were printed on the more substantial card and typically bore the tradesmen's name and address, and before street numbering was in common use, often included a long-winded set of directions on how to locate the store or premises. With the advent of commercial engraving and lithography, illustrations became a standard feature of even the most humble trade card. Eventually trade cards evolved into business cards, which are still in use today. In June 1836, Émile de Girardin editor of the Paris newspaper La Presse was the first to rely on paid advertising to lower its price, extend its readership and increase its profitability. His formula was soon copied by all titles. Early print advertisements were used mainly to promote books and newspapers, which became increasingly affordable with advances in the printing press; and medicines, which were increasingly sought after as modern people rejected traditional cures. However, false advertising and "Quackery" became common. British newspapers in the 1850s and 1860s appealed to the increasingly affluent middle-class that sought out a variety of new products. The advertisements announced new health remedies as well as fresh foods and beverages. The latest London fashions were featured in the regional press. The availability of repeated advertising permitted manufacturers to develop nationally known brand names that had a much stronger appeal than generic products. 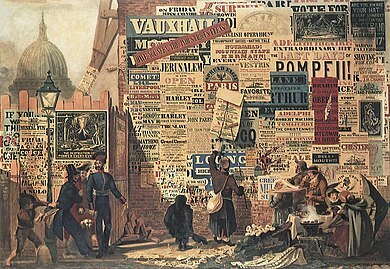 Advertising in the developing world was dominated by agencies in the imperial powers, especially from London and Paris. J. Walter Thompson became the first American agency to expand internationally with the opening of J. Walter Thompson London in 1899. It expanded across the globe, becoming one of the first American agencies in Egypt, South Africa and Asia. Much of the pressure to expand came from General Motors, which wanted to export its automobiles worldwide. Ford turned to N.W. Ayer, which began its expansion in Europe and Latin America in the 1930s. The typical policy was to put an American manager in charge, and hire a staff drawn from locals who had a better understanding of the language and the culture. In 1941-42, however, Ayer closed its foreign offices and decided to concentrate on the American market. In 2011, spending on advertising reached $143 billion in the United States and $467 billion worldwide. During the Nazi era (1933–45), the advertising industry expelled its Jews, and came under the supervision of the "Ad Council for the German Economy," a department of the propaganda ministry of Joseph Goebbels. The relationship was friendly, For the industry learned a great deal from the Nazi propaganda techniques. The industry promoted Hitler's favorite products, such as the promised Volkswagen automobile for the people, and the construction of autobahns. It emphasized the availability of trusted brands despite growing shortages after the war began in 1939. It helped support the regime, articulating a vision of consumption that was well aligned with the Nazi spirit. In some environments and social movements, such as with post-WW2 East Germany Stasi's zersetzung, criminology theorists estimated advertisement was used as a means to crime, the nature of the crime was the intentional exploitation of an individual to cause damage to the individual's ability to form social bonds and appropriate perceptions of the world. This is especially true in the case of manipulation, people take advantage of their underdeveloped social skills and exploit them for selfish gain, this was later criticized to be adopted by turpitude agents of modern advertising. Many major brands were off the market by 1944, because of severe shortages. When they returned after the war, they were welcomed as an index of normality and were not associated with Nazism. Armando Testa Set up a full-service advertising agency in 1956, specializing in the new medium of television advertising. He was inspired by Eastern European animation techniques, and often use simple graphics like the blue hippo. His son Marco Testa, trained at Benton & Bowles in New York, and maintained the fast-paced, witty style. Emmanuelle Pirella, who trained at the Italian offices of Young & Rubicon and Ogilvy & Mather, emerged as a leading copywriter. Dentsu is the dominant firm in Japan thanks to its origins as a media representative. 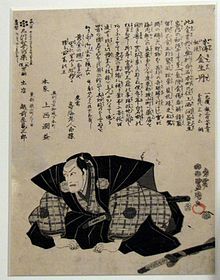 It produced Japan's first newspaper advertisements as well as the first television commercials. It was established in 1901 as Japan Advertising Ltd. and Telegraphic Service Co. by Hoshiro Mitsunaga. In 1936, it sold off its news division to Doumei News Agency, to focus on advertising. In 1946, it purchased 16 small companies and set up operational bases in Tokyo, Osaka, Nagoya, and Kyūshū. Dentsu company now offers a range of services, from traditional and creative marketing to specialty disciplines such as sports marketing, investing in feature film production and acquiring broadcasting rights, PR, digital contents, and a growing range of communications services. The start in 1994 of the North American Free Trade Agreement had a dramatic impact on the adveritising industry in Mexico, with its 130 full service agencies and 270 smaller operations under the auspisces of the Mexican Association of Advertising Agencies. The flood of American brand-name products greatly expanded the scope of the advertising industry, and the Mexican agencies faced new competition from branch offices of international firms. A key to the new market was that upscale consumers in Mexico typically display "malinchismo", which is a preference for imported American brands rather than local Mexican brands. As a result, American products are sold mostly to the middle class market, and their advertising agencies generally avoid working class and rural areas. They concentrate their efforts instead on Mexico City, Monterrey, and Guadalajara, which purchase 70 percent of the American imports. Advertising battles in Mexico, include not only issues of quality, but issues of national authenticity. For example, in Mexico in the 1990s, two American exporters Procter & Gamble and Frito-Lay fought an advertising battle concerning whose potato chips are tastier, more natural, and more Mexican. Procter & Gamble challenged Frito-Lay's Sabritas which controls 80 percent of the $1 billion chip market. ^ Moore, K. and Reid., S., "The Birth of the Brand: 4000 years of Branding," Business History, Vol. 50, 2008. pp. 419–32. ^ Manton, Dafydd (2008). Ale and Arty in Sheffield: The Disappearing Art of Pub Signs. Sheffield, England: Arc Publishing and Print. ISBN 978-1906722005. ^ Clyde Thogmartin (1998). The National Daily Press of France. pp. 53–54. ISBN 978-1-883479-20-6. ^ Beverley Ann Tudor, "Retail Trade Advertising in the 'Leicester Journal' and the 'Leicester Chronicle' 1855-71." European Journal of Marketing 20#9 (1986) pp: 41-56. ^ A. V. Seaton,"Cope's and the Promotion of Tobacco in Victorian England." European Journal of Marketing (1986) 20#9 pp: 5-26. ^ "Obituary, Thomas J. Barratt Dead: Chairman of the Firm of A. & F. Pears an Advertising Genius" (PDF). New York Times. New York Times. 1914-04-27. p. 11. Retrieved 2014-04-06. ^ Ralph Hower, The History of an Advertising Agency: N. W. Ayer & Son 1869-1949 (1949) p 185. ^ a b Eskilson, Stephen J. (2007). Graphic Design: A New History. Yale University Press. p. 58. ^ Daniel Pope, The making of modern advertising (1983) pp 42-46. ^ Hower, The History of an Advertising Agency (1949) pp 58-59. ^ Hower, 'The History of an advertising agency: N.W. Ayer & Son at work, 1869-1949." (1949) pp 140-46, 187. ^ "GroupM forecasts 2012 global ad spending to increase 6.4%". WPP. 2011-12-05. Retrieved 2014-04-06. ^ Parekh, Rupal (July 12, 2012). "Not the 'Big Four' Holding Firms in Adland Anymore – Now It's the Big Five | Agency News – Advertising Age". Adage.com. Retrieved January 18, 2014. ^ Daniel Pope (1983). The making of modern advertising. Basic Books. p. 27. ISBN 9780465043255. ^ Stuart Ewen (2008). Captains Of Consciousness: Advertising and the Social Roots of the Consumer Culture. p. 34. ISBN 9780786722877. ^ Leach, William (1993). Land of Desire. New York: Pantheon Books. p. 375. ISBN 9780307761149. ^ Leach, William (1993). Land of Desire. New York: Pantheon Books. p. 367. ISBN 9780307761149. ^ Leach, William (1993). Land of Desire. New York: Pantheon Books. p. 373. ISBN 9780307761149. ^ Ewen (2008). Captains Of Consciousness. pp. 56–65. ISBN 9780786722877. ^ Jeanne D. Petit (2010). The Men and Women We Want: Gender, Race, and the Progressive Era Literacy Test Debate. U of Rochester Press. pp. 66–67. ISBN 9781580463485. ^ Sherrow, Victoria (2001). For Appearance' Sake: The Historical Encyclopedia of Good Looks, Beauty, and Grooming. Greenwood Publishing Group. p. 5. ISBN 978-1-573-56204-1. ^ Benjamin, L.T., & Baker, D.B. 2004. Industrial-organizational psychology: The new psychology and the business of advertising. From Séance to Science: A History of the Profession of Psychology in America. 118-121. California: Wadsworth/Thomson Learning. ^ T. Jackson Lears, "From salvation to self-realization: Advertising and the therapeutic roots of the consumer culture, 1880-1930." Advertising & Society Review 1#1 (2000). ^ Peggy J. Kreshel, "John B. Watson at J. Walter Thompson: The legitimation of 'science' in advertising." Journal of Advertising 19#2 (1990): 49-59. ^ Heinrich, Thomas; Batchelor, Bob (2004). Kotex, Kleenex, Huggies: Kimberly-Clark and the Consumer Revolution in American Business. Ohio State University Press. p. 83. ISBN 9780814209769. ^ Cruikshank, Jeffrey L.; Schultz, Arthur (2013). The Man Who Sold America: The Amazing (but True!) Story of Albert D. Lasker and the Creation of the Advertising Century. Harvard Business Press. p. 184. ISBN 9781422161777. ^ George Creel, How we advertised America: The first telling of the amazing story of the Committee on Public Information that carried the gospel of Americanism to every corner of the globe (1920). ^ Thomas A. Hollihan, "Propagandizing in the interest of war: A rhetorical study of the committee on public information." Southern Journal of Communication 49#3 (1984): 241-257. ^ Dannagal Goldthwaite Young, "Sacrifice, consumption, and the American way of life: Advertising and domestic propaganda during World War II." The Communication Review 8#1 (2005) pp: 27-52. ^ Richard K. Popp, The Holiday Makers: Magazines, Advertising and Mass Tourism in Postwar America (2012). ^ Dawn Spring, Advertising in the Age of Persuasion: Building Brand America, 1941-1961 (2011). ^ Jannette Lake Dates and William Barlow, eds., Split image: African Americans in the mass media (Howard University Press, 1993). ^ Stephanie Capparell, "How Pepsi Opened Door to Diversity." CHANGE 63 (2007): 1-26 online. ^ Stephanie Capparell, The Real Pepsi Challenge: The Inspirational Story of Breaking the Color Barrier in American Business (2007). ^ Alexandra Stevenson and Shanshan Wang. "A Jump to Mobile Ads in China." New York Times, 22 Dec 2014. ^ Clark Eric Hultquist, "Americans in Paris: The J. Walter Thompson Company in France, 1927–1968." Enterprise and Society 4#03 (2003): 471-501. ^ Sean Nixon, "Apostles of Americanization? J. Walter Thompson Company Ltd, Advertising and Anglo-American Relations 1945-67," Contemporary British History (2008) 22#4 pp 477-499. ^ Harm G. Schröter, "Die Amerikanisierung der Werbung in der Bundesrepublik Deutschland," ["The Americanization of advertising in West Germany."] Jahrbuch für Wirtschaftsgeschichte (1997), Issue 1, pp 93-115, dates the Americanization to the 1960s. ^ Gries, Rainer et al. "Die Ära Adenauer: Zeitgeschichte im Werbeslogan. 'Mach Mal Pause,' 'Keine Experimente!'" Journal Geschichte (1989) Issue 3, pp 9-15. ^ Simona De Iulio, and Carlo Vinti, "La publicité italienne et le modèle américain: le débat entre les artistes et techniciens, 1948-1960," [Italian advertising and the American model: the debate between artists and technicians, 1948-60] Vingtième Siecle (2009), Issue 101, pp 61-80. ^ Adam Arvidsson, "Pubblicita E Consumi Nell'Italia Del Dopoguerra" [Advertising and consumerism in postwar Italy] Contemporanea: Rivista di Storia dell '800 e del '900 (2001) 4#4 pp 649-672. ^ Enrica Asquer, "La Signora Candy e la sua lavatrice: storia di un'intesa perfetta nell'Italia degli anni Sessanta." [Mrs. Candy and her washing machine: a perfect love story in 1960s Italy] Genesis 1 (2006) pp: 1000-1022. ^ Jonathan Friedland, "P&G, Frito-Lay in Mexican—ad standoff," Wall Street Journal (March 19, 1999). Church, Roy. "New perspectives on the history of products, firms, marketing, and consumers in Britain and the United States since the mid-nineteenth century 1." Economic History Review 52.3 (1999): 405-435. 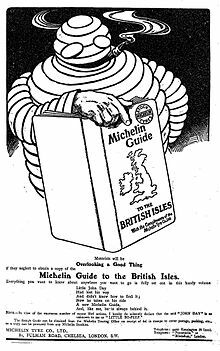 Wikimedia Commons has media related to History of advertising. This page was last edited on 5 April 2019, at 01:53 (UTC).